But once you’ve composed yourself from this unfortunate regular occurrence, the SWSS have already organized a meeting for this Wednesday titled No Platform for Nazi Nick to discuss the issue and is well worth attending if you are around. For those who weren’t around back when this first happened, or have blissfully forgotten that Nick Griffin had come to Ireland, here’s a quick recap. 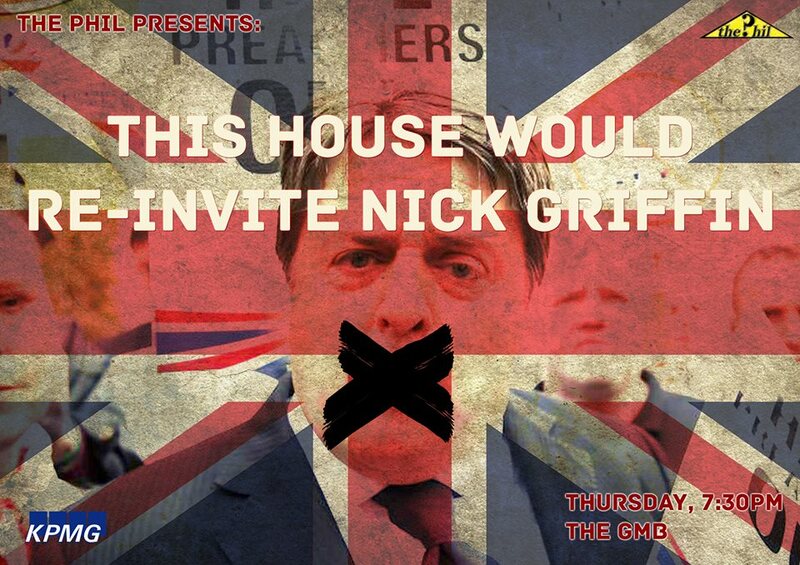 In 2011, in an effort to put bums on seats/show the world racists are stupid, The Phil, invited Griffin to speak at a debate entitled “This House Believes Immigration Has Gone Too Far”. After pressure from anti-fascist campaigners, Griffin’s visit was cancelled by the university citing safety concerns for staff and students. The following semester, University College Cork’s Government & Politics Society attempted to invite Griffin down south, this time in a free speech debate. This invitation too was withdrawn also citing safety concerns. Now, with the possibility that Griffin could be on his way back to Ireland’s oldest university, it all seems like an unfortunate case of Déjà vu. In the wake of the UCC invitation and among all the discussions surrounding free speech and no platforms for fascists, Gavin Titley had an excellent piece on TheJournal.ie. It summarises the invitation of Griffin and its effects excellently. In the case of TCD, the Phil act as ‘liberal enablers’ (a great term) who have no obligation to provide a platform to Griffin or indeed anyone who spouts racist, homophobic, sexist etc but want to. This isn’t out of giving people a right to free speech, Griffin already has that. It’s about a society getting a hate figure to say some terrible things and their liberal ego is stroked for them being how clever they are. The argument also given out by many who would give the BNP a platform often argue that no one really takes their views seriously. This thinking is nothing more than delusion by liberal enablers. In a world where neo-liberalism is dragging the political centre and centre left ever further to the right of the scale, left alternatives seem further and further away. In the meantime, far-right parties merge the populist policies with attacks on migrants, the LGBT community and anyone who opposes their ideas. All over Europe, from the protests in Ukraine, to the recent local electoral success of the Front National in France, far-right parties are gaining more and more influence in political life. To think this won’t or isn’t happening in Ireland already, a country that is suffering from some of the worst austerity in Europe is beyond foolish. While that might not seem important to a middle class student debating free speech in the Phil, giving platforms to fascists mean a hell of a lot to a migrant working in France or a LGBT member in Ukraine. Ninth Level Ireland » Blog Archive » Nick Griffin to Debate at Trinity? … Again? « The Nature of Irish Student Politics.